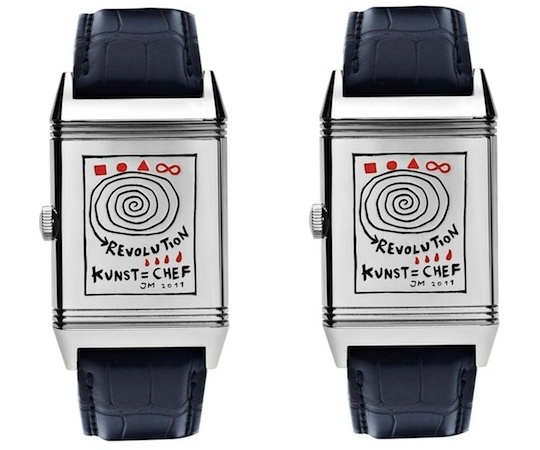 A clever watch from Jaeger-LeCoultre and visual artist Jonathan Meese, the “Reverso” features a watch face that flips 180-degrees to reveal the mechanical movement opposite the cheeky artistic interpretation of a movement. Not only does this allow the watch to be visually interesting when not in proper usage, it serves the practical function of protection the watch face. Jaeger-LeCoultre originally conceived of the design to appease British colonial army officers stationed in India who were tired of their timepieces getting destroyed. The design remains a cult favorite and only two of these Meese designs have been produced. They will be auctioned via an email bidding race, with proceeds going to the German Apoplexia Foundation, advocates for modern and efficient care for patients who suffer from apoplectic strokes. This entry was posted in Accessories, Misc and tagged Jaeger-LeCoultre, Jonathan Meese, timepiece, Watch. Bookmark the permalink.